THIS IS NOT A DRILL!!! 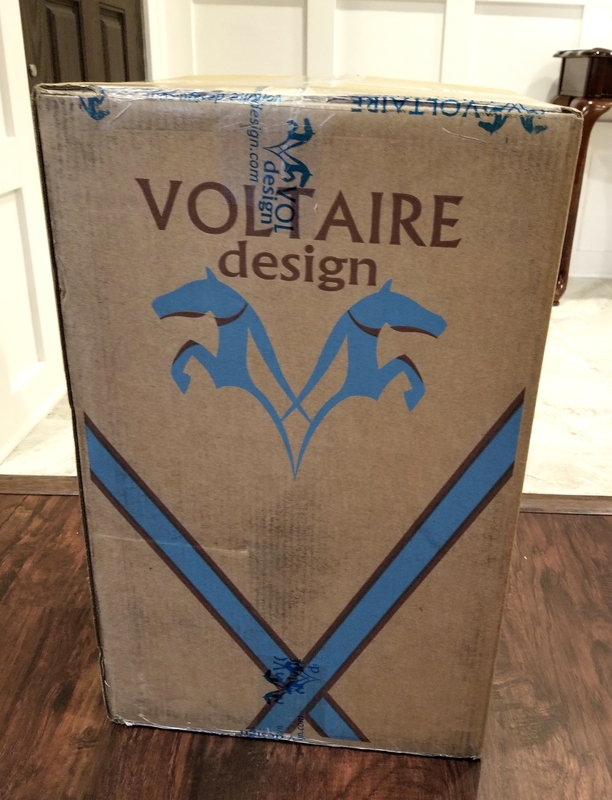 My Voltaire saddle has finally arrived! 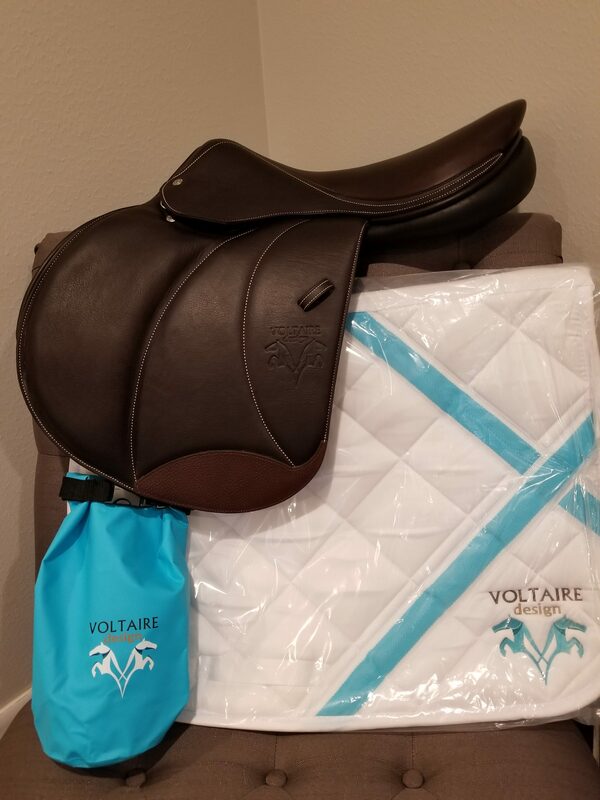 My Voltaire Palm Beach saddle arrived yesterday. My hubby sent me pics of the box while I was at work, and I considered asking my boss if I could leave early. Only sort of joking. I was THAT excited. 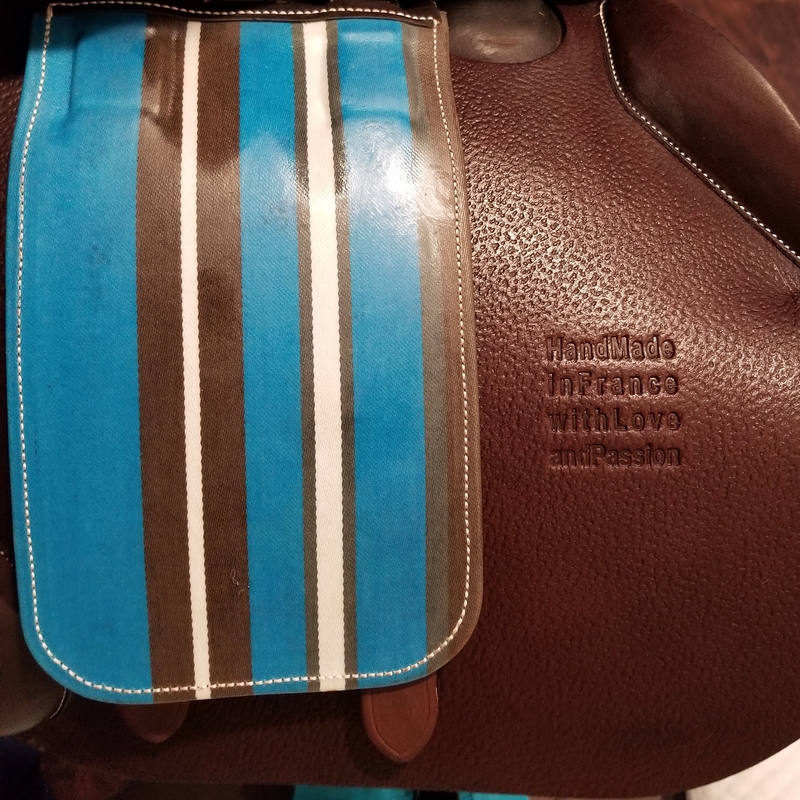 This may be the only time in my life that I get a brand new saddle (hello 30th birthday present, thanks hubby!!! ), so the anticipation and excitement was almost literally killing me. Almost. I may have had a tiny panic attack on Sunday when the FedEx tracking said there was a clearance delay in customs. 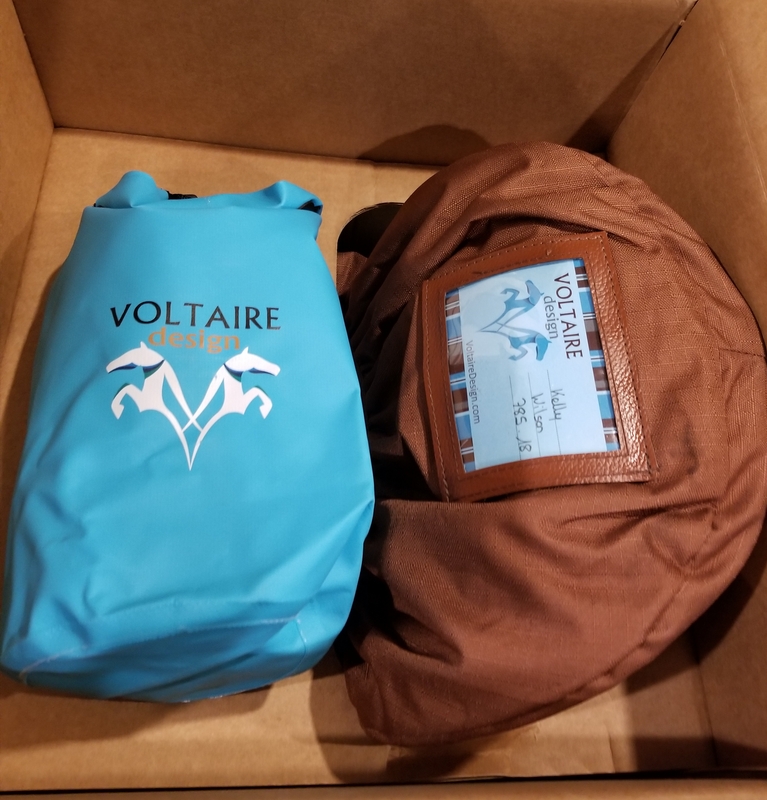 Thankfully, my rep is awesome and she called the US Voltaire office first thing on Monday morning, and by the early afternoon they had it all sorta out and it only delayed delivery by 1 day. I counted the minutes until I could race home to open it up. 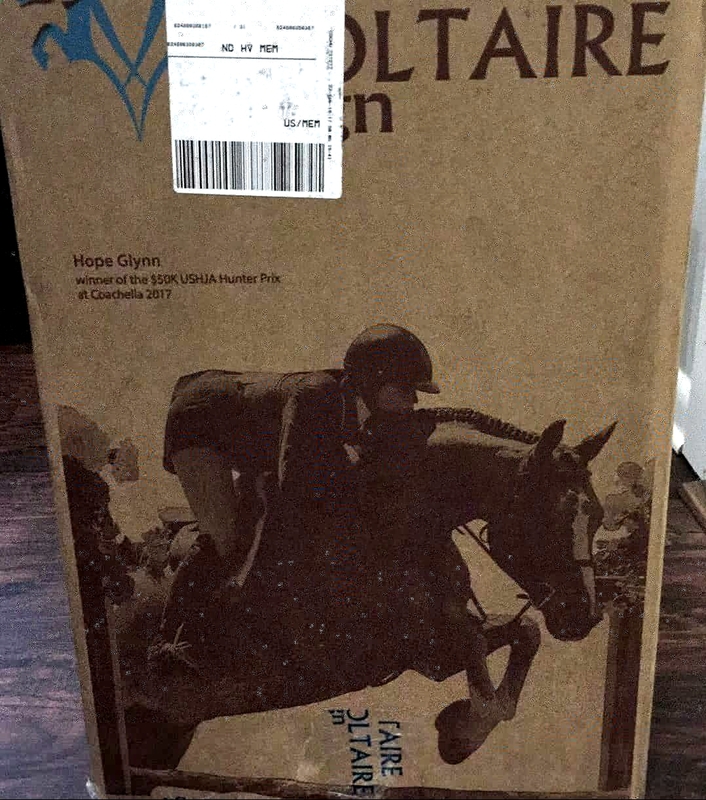 I was hoping and praying that the saddle would be what I ordered. 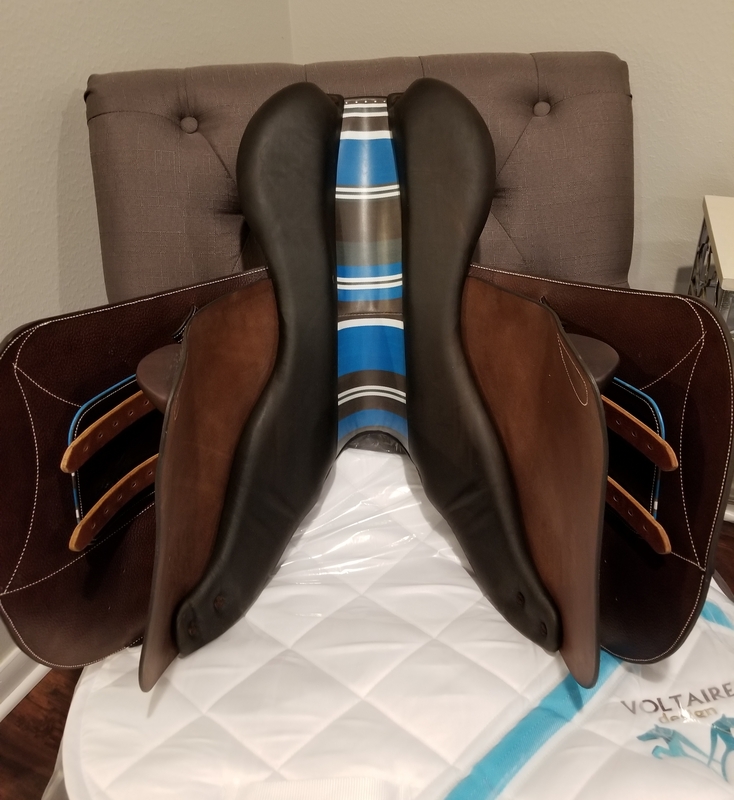 You always hear those horror stories about semi-custom saddles coming in and NOT being what was actually ordered (i.e. different flap config, different panels, etc). I also read somewhere about someone’s saddle plate having their name misspelled. THE HORROR! (only kind of kidding). I was going to be mega disappointed if there was some kind of mix up and I had to send it back. At 4 pm I basically ran out of the hospital and sped home, even shaving 2 minutes off of my commute, which is impressive when you realize my commute is only 15 minutes. 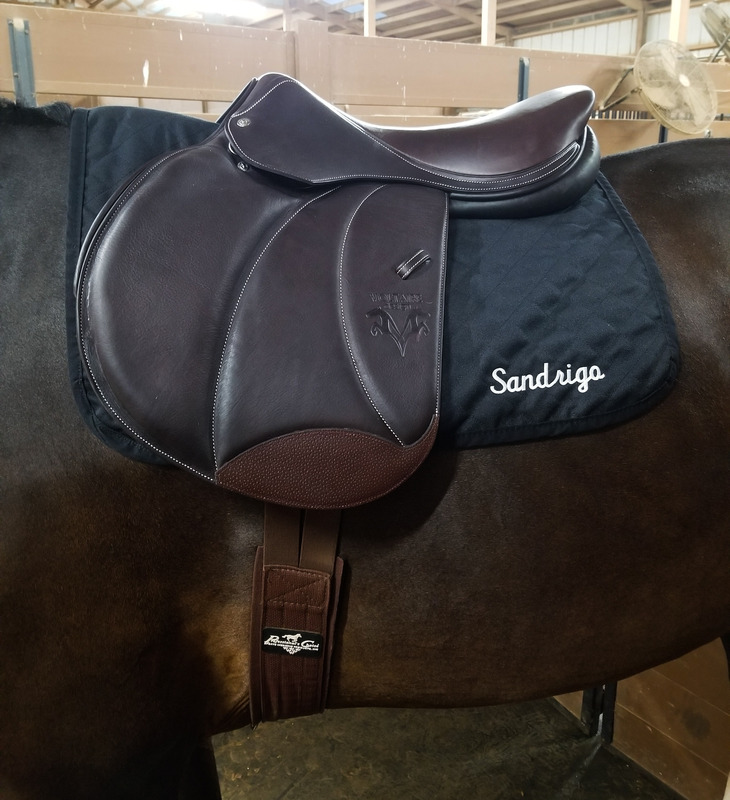 They also didn’t forget the saddle pad. YAY because it is SUPER cute! Mandatory photo-op before I even take off the saddle cover. Still nervous at this point. OMG IT IS SO PRETTYYYYYY. Still need to check the specs printed on the flap. 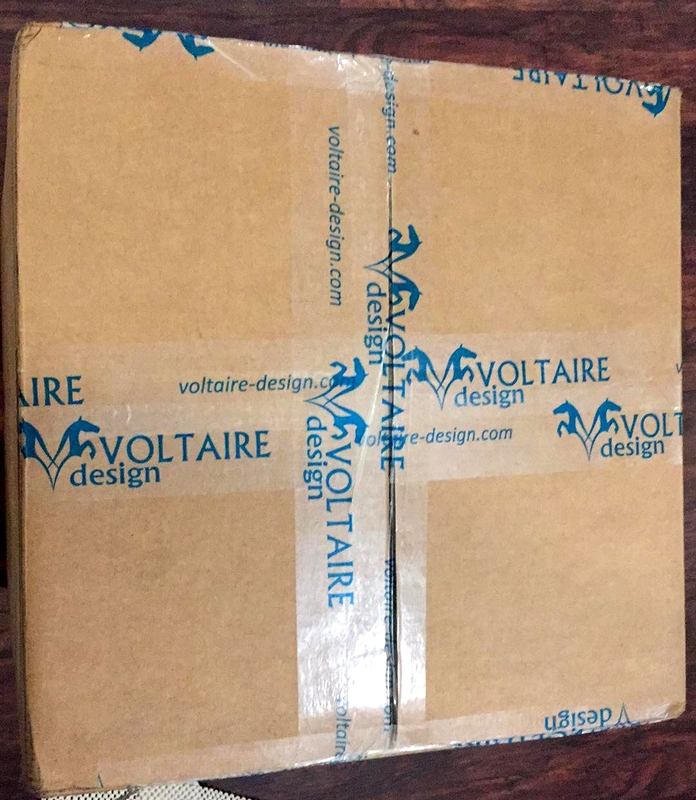 Voltaire Design love. Doing a major happy dance at the point because it looks exactly as ordered! Next step was to head to the barn and try it on Rio. Everything looked good so far, but obviously the real test was yet to come. 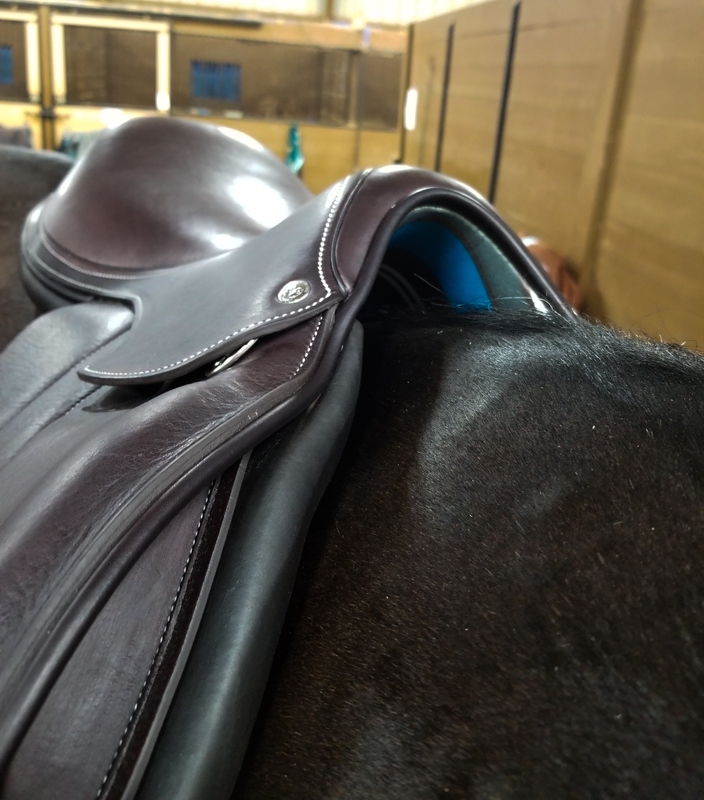 I am by no means expert on saddle fit, so it will still need a thorough checking over by those more experienced then I, but I was pleased with my initial assessment! Much better wither clearance then my Antares (I couldn’t ride without a half pad at all). Also a better fit then the demos that didn’t have the extra foam on the panels that this one has. Still loving the fit once properly girthed. Baby pad only. So far- ALL IS WELL! I am very happy with everything right now. Do I know if it is a perfect fit for Rio and I? Not yet. I have 3 months to get a feel for it, and request any changes as necessary. I obviously cannot tell from one ride, but I like what I feel right now. Leather still needs breaking in obviously, but the balance felt really good. The sitting trot is SO EASY in this saddle. 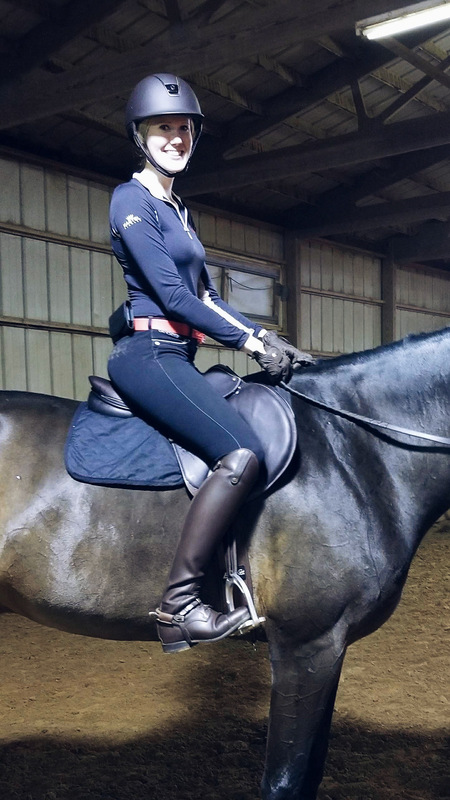 I had to ride in a crowded indoor arena (thanks Texas for the monsoon) so what we did was a bit limited, and definitely no jumping, butttt so far so good! Not a great pic,but better then nothing. Still need to play with stirrups lengths etc. My name is Kelly and I’m a late 20 something who is living the dream of owning a horse as “an adult”. I have officially become the Adult Amateur that I once dreaded as a youth- and I’m loving every horsey moment of it. Over the years I’ve dabbled in most English disciplines, and have firmly landed in hunter land. 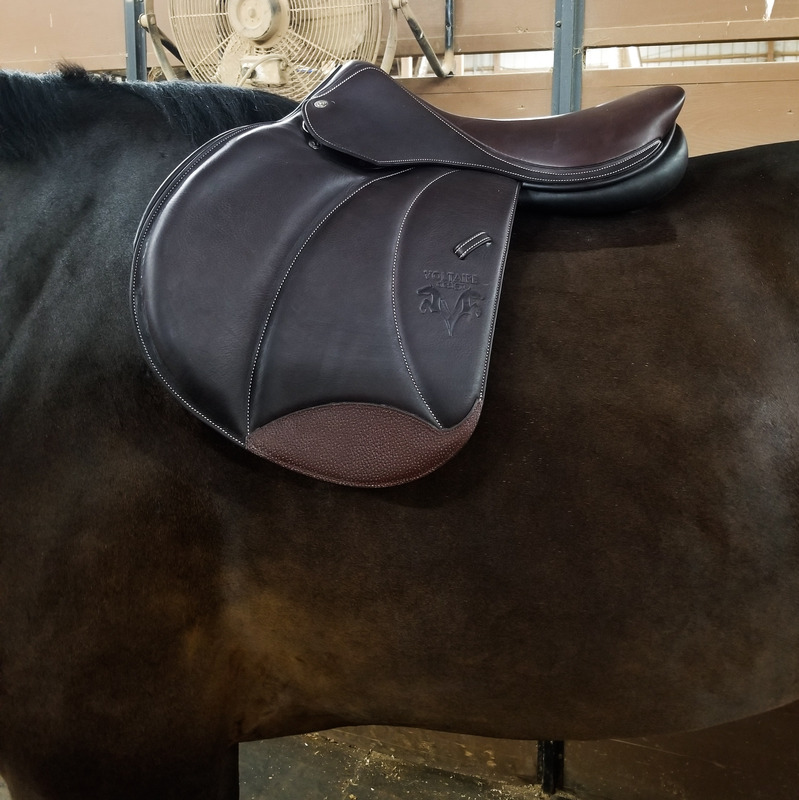 Now that I am finally living the horse owner dream I chronicle the excitement, disappointment, and general hilarity in this blog. I love those pops of color on it! Thanks! I didn’t initially want all that color, but since you can’t see it while riding I have warmed up to it and even think it’s pretty now! Congrats! I have the exact same saddle and it’s heaven to ride in compared to my old CWD. I’m jealous of the bag your rack cleaner came in though! Awesome!! How long have you had yours for? Did it break in quickly? Did you need to have them make any adjustments? I gotta say, I’m impressed with the bag! Better then some crappy bag that’s for sure! wow it is pretty your precious. I too love the color combo with the teal etc. Seems awfully sparkley for a hunter 🙂 HA HA HA it is very nice. SO the big question is did you bring it home with you? My Stubben is sitting in my dining room right now. I CANT LEAVE IT in the tack room. OMG if something happened? WHATW OULD I DO? (real issues I have HA HA HA). Congrats it really is gorgeous!! I would have totally run out the door of work to go home and open it! Hahaha! YES, it is a bit “bright” but thankfully you can’t actually see if it when riding. I did ask about getting something different, and they have this GORGEOUS medium blue (not bright) crocodile they can do- but it was $900 extra!!! I actually do leave it at the barn. My tack is in my old trainer’s private tack room currently, and only like 5 of us have the door code, so I’m not too worried! Voltaire fans unite! I have a Stuttgart and it is my second best friend (my Rio is first best friend). I got mine used, but it’s pretty close to perfect as is. 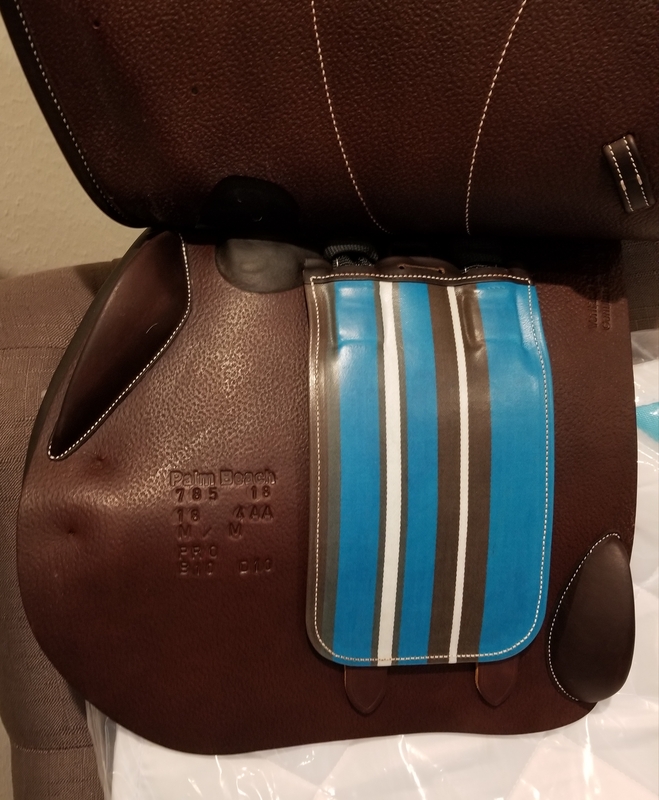 Since I have multiple horses, it doesn’t make sense to have it fit to just one of them, so I still need to use different pads for different ponies. Not a big deal though. I had it shipped to my work because I knew I would die if it delivered to my house and I couldn’t see it asap! So pretty!!!! I would love to have a custom saddle like that. Alas, it’s not in the budget now. But maybe I can save up for it for a 30th bday present as well! I’ve got a few years still! 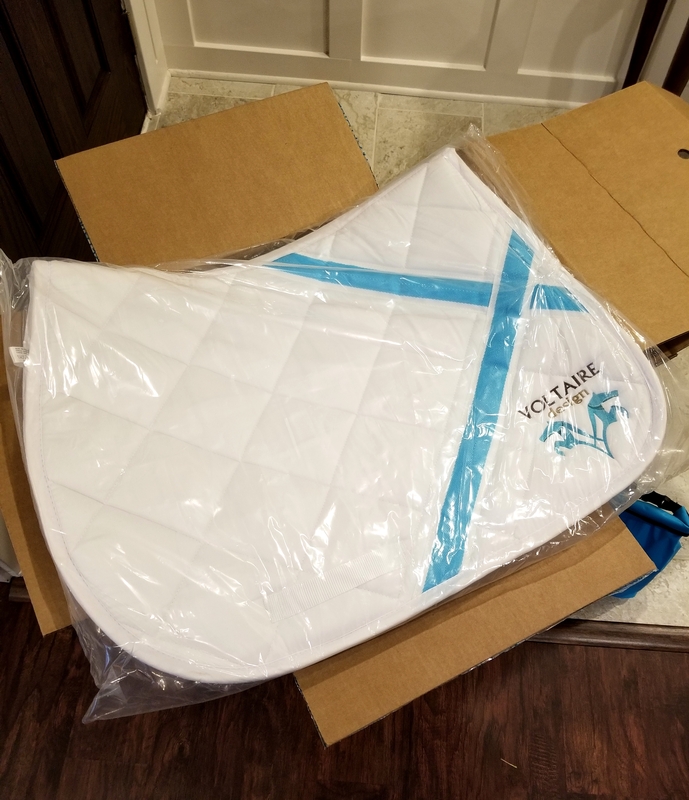 I can’t wait to hear how it feels while breaking it in and jumping! That is lovely, and all the accessories are in my favorite color. That is enough to save up to splurge right? 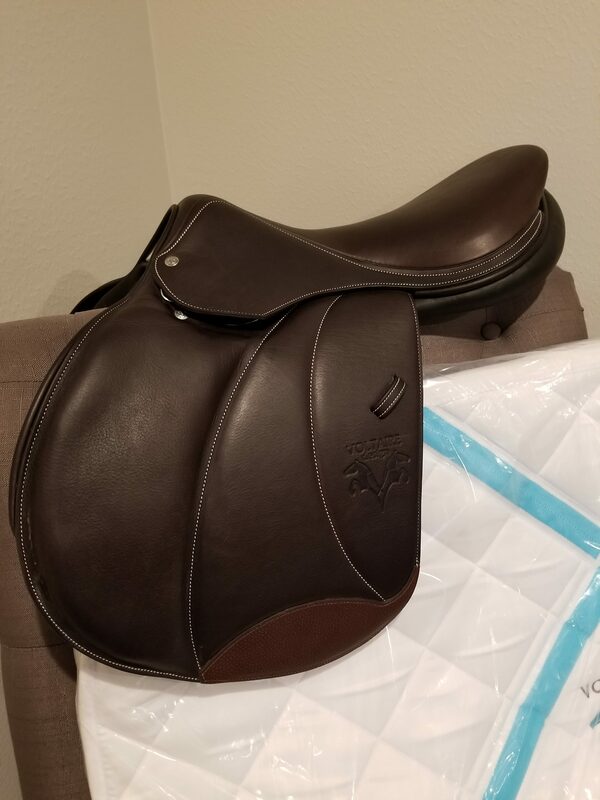 I think when I buy another horse (1yr, 2yr, who knows) I’ll go for a custom saddle. Right now I use mine to ride my lease (who is likely to retire within the next few years) and a few other schoolies so it wouldn’t make sense for a custom. 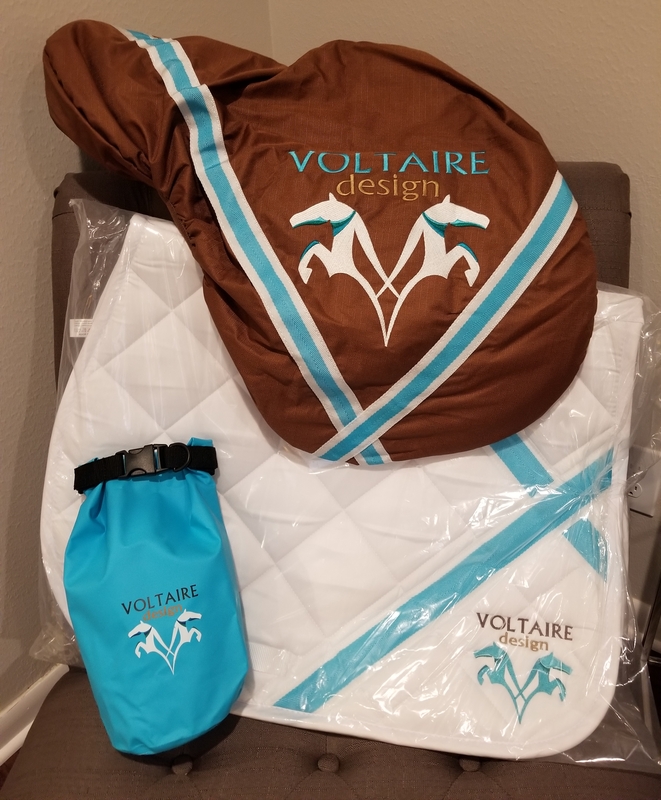 I can’t wait to see updates on how you feel about the Voltaire! Oh is it ever pretty! Daaamn. I’m so excited for you. All the accessories are super sweet. And I hesitated about “wet bag” then I realized Oh! That’s what we call a dry bag! Lol. I never knew people called them by the antonym – how funny! I had a Voltaire Palm Beach when I owned a horse that one would fit (super fat draft/QH need not apply). I bought it used, and was actually able to sell it for more than I bought it for after like 2.5 years of use. The balance on them is incredible and the leather breaks in SUPER nice. Yayy love hearing from other Voltaire lovers!! It is breaking in beautifully so far! Thank you! 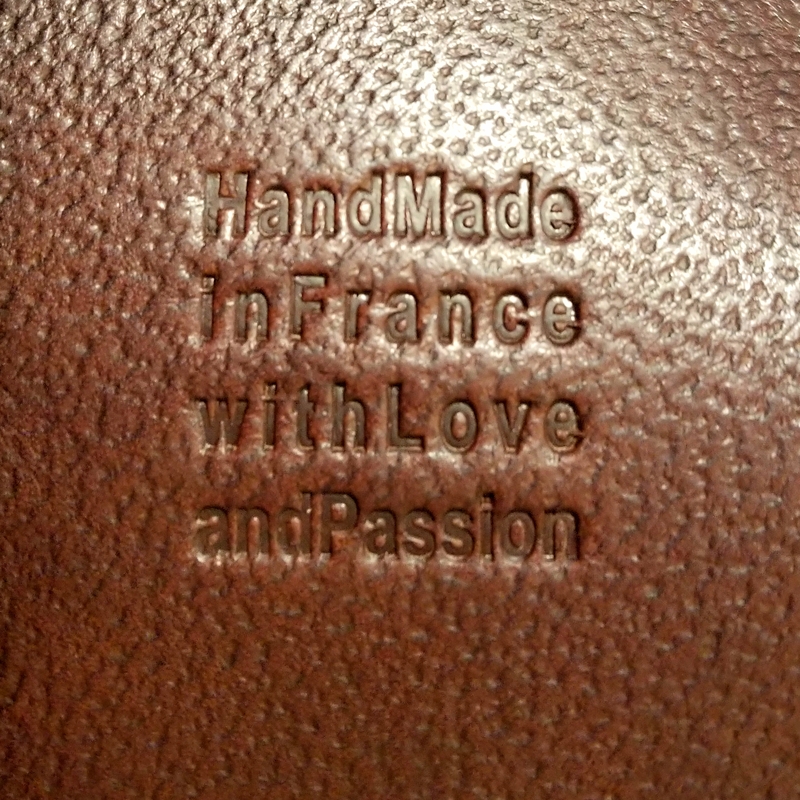 I definitely think Voltaire has cornered the market as far as beautiful leather goes- soooo stunning in person!